The air smelled good. 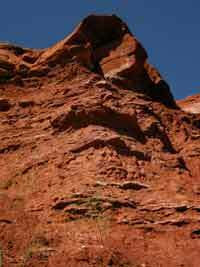 We woke early, anxious to make the most of our “pause” in this spectacular canyon. We wanted to explore it’s vastness up close and we actually had the time, as today was a “rest” day — it was the first day we weren’t driving since we set out on Route 66 (see Rythym on the Road for more about trip pacing). Though “rest” doesn’t actually mean “rest” — we were going hiking. 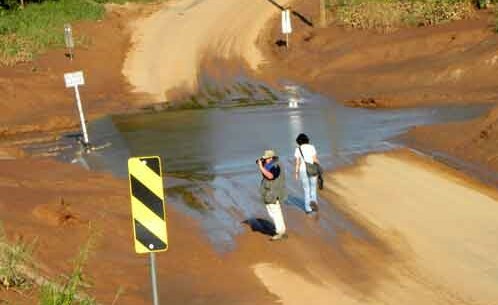 We crossed the Prairie Dog Fork of the Red River at one of the shallow spots where the road goes right thru the stream. The water level was so low, it seemed like just a little puddle. It was already hot out and it wasn’t even 9am. We decided to pick a route that had plenty of shade — combining the Sunflower trail with the Rojo Grande trail. Wild sunflowers marked the beginning of our path, and we stepped into the colors of an expressionist’s pallete. The brilliant bursts of bright yellow, surrounded by vibrant green. The earth itself was red, as if scorched by the sun. It was magnificent. Wildflowers, cactus, some kind of palm-like bush — not exactly desert, but the beginning of plants we associate with hot places. And it was getting hotter. 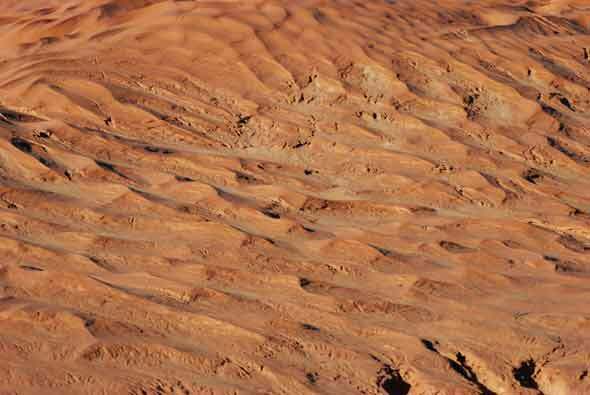 Thankful for the shade we continued along, walking into the folds of the red earth itself, gullies created by water careening down canyon walls, now dry as hardened clay. And then we hear a trickle of water, see the stream on the other side of the brush. In the distance a huge red earth column stretches upward like a terra cotta skyscraper. It was almost mystical… until, “bbbbuuuuuzzzzzzzzz”…. SWAT! Despite the lack of humidity, there were quite a few mosquitos. And “Silly Squirrel” couldn’t bear the mosquitos. For the first half of the hike he tried just swatting them, then finally, in utter desparation, he tried to outrun them, taking off down the trail at a sprinter’s pace. 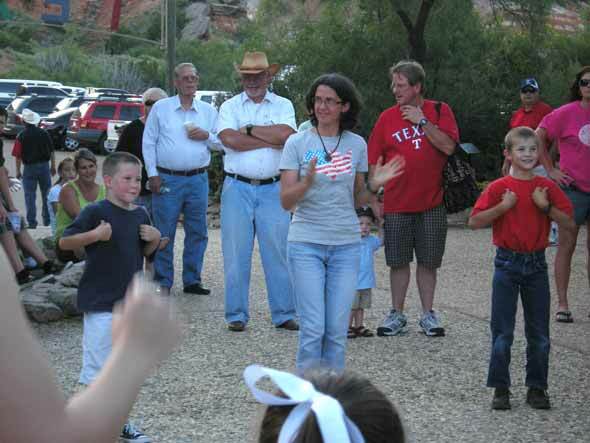 As most of the grown-up dancers gave way to the kids, park staff led the little ones in some Texas line dancing. “Cactus Killer” followed along, even attempting “The Chicken” and “Cotton-Eyed Joe” with some success. She was having a great time (and all this BEFORE the show even began)! With “show-time” fast approaching, we headed to find our seats in the outdoor theater. A cowboy mounted on a white horse was outside, and “Silly Squirrel” went over to say “Hi!” The horse nuzzled him, as if to give him a kiss. The rider smiled. He was a performer in the show, getting ready for the action to begin. We hurried to our places in front of the stage right out on the canyon floor and soon enough we understood how integrated the show was with the natural setting. 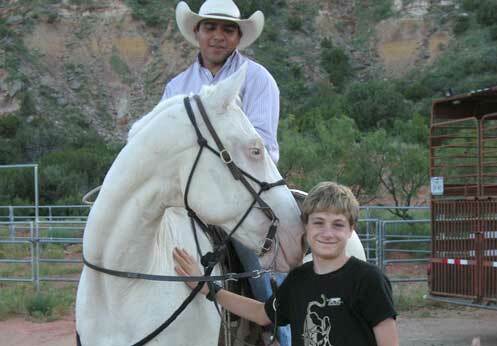 Far up on the rim of the canyon above, the lone rider with the Texas flag made his appearance, and the story began. In true Texas style, it was a BIG production. A little bit about the history of the Texas Panhandle itself–cattle ranchers versus farmers, the fencing-off of the land, the arrival of the railroads and the end of the “wild” west. But what made this show truly special was the use of the canyon space. The natural environment added depth to the action on stage, the far and middle background of the canyon provided the backdrop for all kinds of movement, horses and pyrotechnics, and even an amazing scene where the whole prarie seems to be on fire. It all culminated in a fabulous fireworks display, and as the horsemen rode by with the flags, it was the Texas flag that got the loudest cheers! 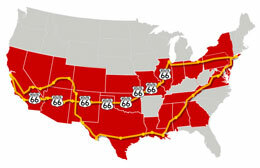 This entry was posted on Tuesday, January 31st, 2012 at 10:12 am. It is filed under Notes from the Road and tagged with amarillo, americana, attractions, camping, canyon, cowboys, fireworks, hiking, history, impressions, landscape, palo duro canyon, performance, texas, tourism, wild west. You can follow any responses to this entry through the RSS 2.0 feed.